Inca Science, Innovation & Technology - HISTORY'S HISTORIESYou are history. We are the future. Geography: ​How do people interact with their environment? Review: Why were llamas useful to the Inca? The Inca Empire was a complex society with a population of around 12 million people. They had large stone cities, beautiful temples, an advanced government, a detailed tax system, and an intricate road system. The Inca, however, didn't have a lot of basic technologies we often consider important to advanced societies. They didn't use the wheel for transport. They didn't have a writing system for records (though they did have mailmen to aid communication!). They didn't even have iron for making tools. How did they create such an advanced Empire? The Inca were problem-solvers. When faced with a problem, they came up with some interesting and effective solutions. The Inca empire’s rapid expansion in the 15th century CE also played a role in the development of new technologies. Expansion put new demands on the Inca government and as the empire grew, Inca rulers needed to find new ways to unite the many different peoples under their control. Expansion also led to an intermingling of cultures. Just as it always does, cultural interactions led to new ways to understand and to meet technological challenges. Their job was made all the more difficult due to their unique geographical considerations. In fact, while it’s easy to relate advances in farming, government, record keeping, and architecture to the needs defined by the rapid expansion of the empire, geography shaped their technological adaptations. Below are some of the important innovations and technologies used by the Inca Empire. What three things did the Inca government do as soon as it conquered a new tribe? During their period of rapid expansion in the 15th century, the Inca needed to incorporate numerous new tribes into their growing empire. Big challenges included moving troops, keeping records, and carrying communications and trade goods. In order to meet those challenges three things happened as soon as a new tribe was conquered or voluntarily joined the Inca empire. If the government needed workers somewhere, some of the conquered people were sent to help out and some were sent to join existing ayllus (a group of Inca families) in various parts of the empire. People who were moved about often did not speak the language of the group they were joining. This pretty much wiped out all chance of rebellion. Of course, communicating where workers were needed was another challenge. The road system the Inca built was part of the solution to their “communication problem.” An innovative mail delivery system was the other part of the solution. Brain Box: Which of the three things was most effective in uniting the Inca's growing empire? Just as the ancient Romans did, the Inca connected their vast empire with a system of roads. Undaunted by the geographic challenges they faced, Inca engineers built their roads across plains, deserts, rivers, ravines, and mountain passes up to 15,000 feet high. Inca roads linked settlements and administrative centers. The main purpose for the roads was for communication, moving army troops, and to transport goods. Commoners were not allowed to travel on the roads. What were Inca roads used for? In less than a hundred years, it’s estimated that the Inca built nearly 25,000 miles of road. Some sections of road were over 24 feet wide. Some sections were so steep that the Inca built stone walls along the edge to prevent people from falling off cliffs. Many sections were paved. Well-built and long-lasting, many roads included bridges and llama-friendly stairways. Small stations and sometimes larger, more luxurious complexes were built every few miles throughout the empire so that travelers could spend the night and refresh. ​​Pontoon Bridges: As another option for crossing the many creeks, streams, and rivers within the empire, the Inca also created a type of floating bridge called a pontoon bridge. To craft these bridges Inca engineers stretched reed mats between floating boats made of reeds. Doing so allowed travelers to cross short distances over surface level waterways. Pulley Baskets: As an alternative to their suspension bridges in the mountains, the Inca constructed pulley baskets. To use these, two or three travelers at a time would climb inside a basket. The passengers were then pulled to the other side of a river or an especially deep gorge. The advantage of the pulley basket was that it could move travelers over greater distances than could be reached with a rope bridge. Who Could Use the Roads? The roads belonged to the government. No one could travel the roads without special permission. Common people certainly could not use the roads. The army used the roads, however, to move quickly and easily to any point in the Inca empire. Doing so allowed the army to quickly stop rebellions and to protect people from intruders. The roads also allowed the army to quickly bring supplies to victims of natural disasters. Llama trains could use the roads as officials collected food from farms and moved it to cities and to storehouses along the road. The roads also allowed the government to efficiently communicate with governors in far off provinces. What was the job of the Inca mailmen? All governments need a way to communicate orders, instructions, and laws to their people. The Inca, however, did not have a written language. Yet, timely communication is essential for a government to be effective. Communication was made all the more difficult by how large the empire was. To put their difficulties in perspective (sort of), imagine that you have a message that you need to get across the classroom. Like the Inca, however, you can’t write it down. Now, imagine that the classroom is 2500 miles wide, far too great a distance to simply shout. If you will, also imagine that our very wide classroom is divided by deserts, rivers, ravines, and high mountains. If you can imagine that scenario, then you can begin to imagine the challenges faced by the Inca. What would you do? The Inca devised a reliable system in which young men ran in relay fashion along the roads carrying messages back to the capital. Those young men were the mailmen of the Inca empire. They were called Chasquis. It was each runner’s job to run a mile or two down the road. As he approached the next relay station, the runner blew loudly on a conch shell to alert the next runner to get ready. The next runner would appear, running alongside him. Without stopping, the first runner told the second runner the message. The second runner sped ahead until he reached the next relay station. And so it went, from one point in the empire to another. Why was the job of Inca mailmen so important? Messages had to reach the Sapa Inca accurately. If it was discovered that a message was not accurate, punishment was severe. Punishment did not only descend upon the person who delivered the message but could track backward to anyone who had a part in that message. It was important to be accurate. When messages were secret, runners carried the message in the form of a quipu, a series of knots and colored string. The quipu would be handed from runner to runner until it reached its destination where a special quipu reader would decipher the message. How did the Inca protect their cities against attack? ABOVE, the massive fort at Sacsayhuaman where Inca would seek safety behind the fort's massive stone walls during times of threat. While the Inca are well-known for the quality of their road system, the Inca also built the best-planned cities in the ancient Americas. The Inca laid out their cities in a grid, similar to modern American cities. Each city had a central plaza. Public buildings and temples surrounded the plaza. There was housing for priests and nobles. And, just in case the Sapa Inca visited, a palace was built. In Inca cities other than the capital, houses were even built for the common people. Most Inca cities did not have walls around them. For protection, the Inca built large stone fortresses near or beside their cities instead. In times of danger, people could run inside the fortress. The rest of the time, the fortress housed some of the military. The military checked everyone coming in or out of the cities. Because of that, Inca cities were very safe. Inca architecture mirrored the mountainous terrain of their homeland. How did Inca architects make their buildings match the surrounding landscape? 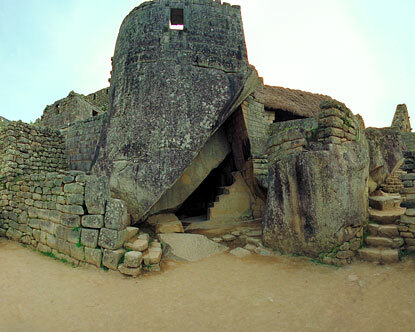 The Inca were master builders, and they liked their buildings to match the surrounding landscape. 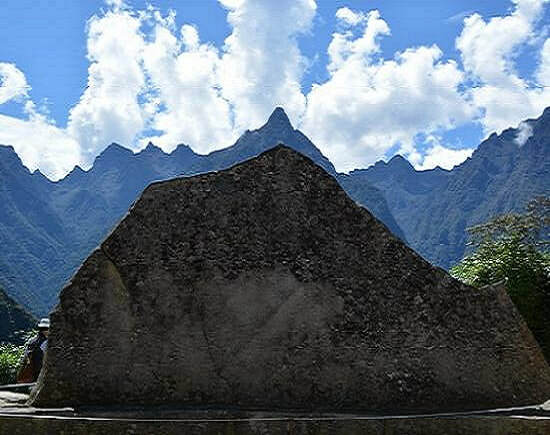 Living high in the Andes mountains, they used stone. Inca stone workers were some of the best in the world. They were able to cut their stones so precisely that when fitted together there was no need to use mortar. ​Just like the mountains that surrounded them, buildings were constructed to last and to survive natural disasters such as earthquakes. Doorways and window niches sloped inward slightly at the top to better support the structure of their buildings and homes in times of storms, high winds, and earthquakes. Roofs were also slanted, creating an additional clever reminder of the surrounding mountains. Inca buildings were amazing structures. Terraces at Machu Picchu allowed for high altitude farming. One of the most magnificent Inca sites is the ancient city of Machu Picchu. Archaeologists were excited about finding the ruins of this city in 1911. One of the things that makes Machu Picchu truly special is that it was very nearly complete when it was found. While Machu Picchu is not as big as a normal Inca city, it seemed to have been untouched by time. Indeed, when it was found it appeared to have escaped both the ravages of the Inca civil war and Spanish plunder. 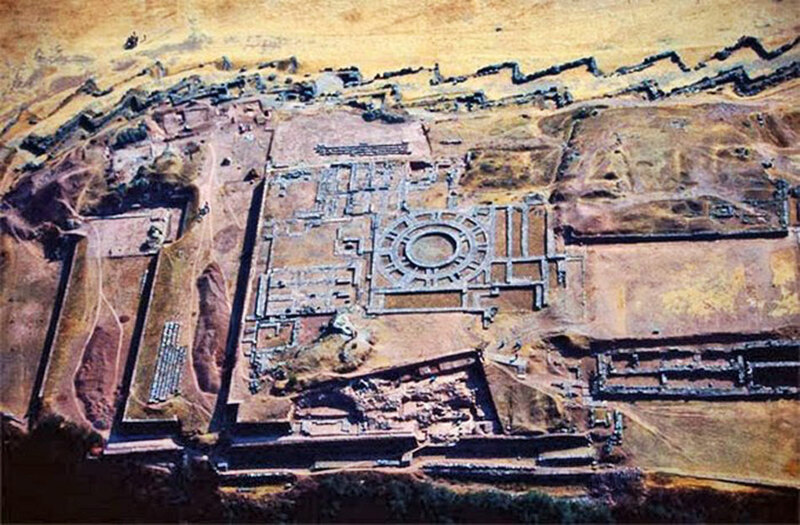 Some archaeologists believe it was a country estate for the Sapa Inca. Others believe it was a religious retreat. It has been just over 100 years since Machu Picchu was rediscovered. At Machu Picchu, explorers found ruins of temples, palaces, fortresses, and a royal tomb. They found remains of pottery and the stone aqueducts that brought water into the city from over a mile away. They found remains of terrace gardens and homes for farmers, nobles, and priests. It was quite a find for the explorers who discovered it! Machu Picchu is a good example of the Inca practice of shaping architecture around the natural features of the landscape. With thought to both the purpose of the construction and the natural surroundings, ridges were made into plateaus on which the Inca could build, and stone bulwarks were used to create terraces for farming. Even today, visitors often comment on how the buildings so seamlessly blend with the surrounding hills. For example, the profile of the Sacred Rock actually mimics one of the mountain peaks behind it. Very often, windows and doorways were deliberately positioned to capture the best views of the surrounding mountains. Some structures were partially carved out of the stone. Great examples include the Royal Tomb and the Condor Temple. The cave-like area of the Royal Tomb contains ceremonial niches and an Inca cross carved from one wall. The cross resembles a series of steps, and represents the three levels of existence in the world of the Inca. The first step, symbolized by the snake, represents the underworld or death. The second step represents the present and human life and is symbolized by the jaguar. The highest step represents the spiritual realm of the gods and is symbolized by the condor. carved a rock in the shape of the condor's head and neck feathers on the floor of the temple. Under the temple is a small cave that contained a mummy, leading some historians to speculate that the head of the condor was used as a sacrificial altar. ​Cleverly linking the heavens with the fate of those on earth who might offend either the gods or the Inca government, a prison complex stands directly behind the temple and comes complete with and underground maze of dungeons. What are at least three things the Inca did to make up for their lack of a written language? Along with the incredible engineering of Inca roads and bridges and the delicate balancing act of their massive stone buildings, the Inca showed ingenuity in other matters as well. Inca Calendar: The calendar was important to the ancient Inca for religious reasons. A different religious festival was hosted each calendar month. The Inca calendar was divided into 12 months. Each month was divided into three weeks. Each week had 10 days. The Inca used special towers called “time makers” that told them when a new month was to begin. Time makers used the position of the sun to mark the passage of time. As needed, the Inca simply added a couple of days to the month to make it right. Musical Instruments: The Inca loved music. They invented many wind and percussion instruments. Drums and flutes were very popular. The panpipe was the most popular. A panpipe is a group of single pipes tied together in a row. Each pipe in the row makes a different sound. Panpipes are still played in the Andes Mountains today. The quipu had a main string about two feet long. Many additional colored strings were tied to the main string. Using a base of ten, each string had knots in it. The color of the strings and the distance between knots all had meaning to the Inca. One of the specialized professions was the quipu reader. Very few people could read the quipu, which is true even today. Freeze-Dried Foods: The Inca invented a system of safe food storage: freeze-drying. First, they stomped their food to remove as much water as they could. Then, during the day, they left their food out in the sun to dry and at night left it out in the cold to freeze. When they wanted to use the dehydrated foods, they simply added water.